FIFTEEN new bikes have been added to the fleet of NavyFit loan cycles at Portsmouth Naval Base to encourage workers to use two wheels instead of four to get around. The scheme provides an optional means of alternative transport for all MoD and naval base staff. Naval leaders hope the new cycles will help boost efficiency and the quality of life of all those working in the city’s military hub. Similar to ‘Boris Bikes’, the scheme initially functioned with 15 bikes operating from three docking stations located at Victory Building – the base’s HQ – as well as Lion Gate and the HMS Nelson Personnel Centre. Due to popularity and demand, particularly at the waterfront, an additional three shelters and 15 bikes have now been added to the fleet. The new shelters are located at North Corner, Fountain Lake Jetty and Trafalgar Gate. 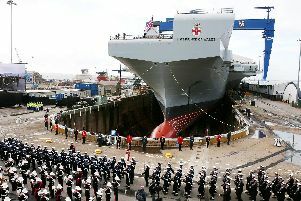 Captain Bill Oliphant, base commander, said: ‘The great advantage of the expansion of the scheme is that we’re getting to the extremities of the naval base now. ‘It’s so much easier for ships personnel especially to get from places like Fountain Lake Jetty to the personnel centre and HMS Nelson in an efficient way. The bikes were funded from the Rebalancing Lives fund, supplemented with grants from the Royal Navy and Royal Marines Charity and the RN Sports Lottery.